Travel documents for North Korea. My US Passport was used as my main ID, however my visa for DPRK, behind passport with photo, was not included in my US Passport. US and DPRK don't have diplomatic relations, and therefore the visa and stamps wouldn't be officially recognized in my US passport. 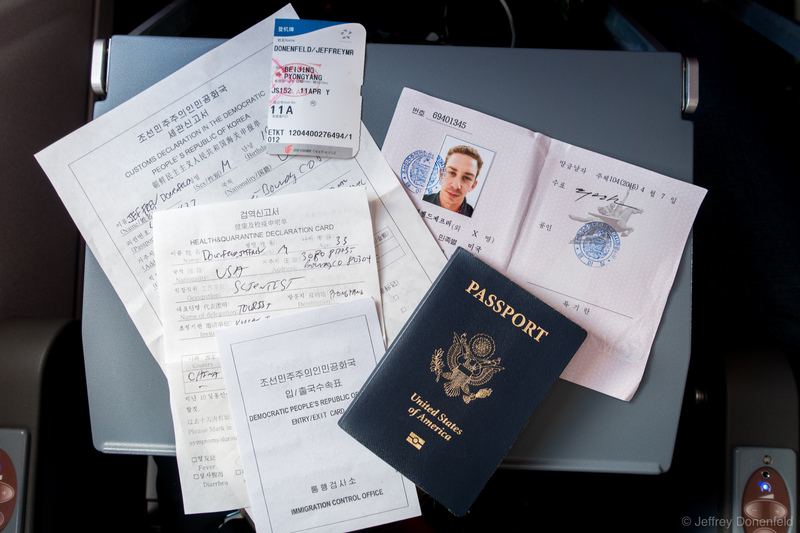 Once I was in North Korea and through the immigration desk, my US Passport and visa document were both collected from me, and held by one of the government tour guides for the remainder of the trip. It was a strange feeling to have my passport taken from me, and made me feel like if I messed something up, they'd just keep it. Also in this photo are my ticket stub, customs declaration card, health & quarantine declaration card, and entry/exit card. Travel documents for North Korea. My US Passport was used as my main ID, however my visa for DPRK, behind passport with photo, was not included in my US Passport. US and DPRK don’t have diplomatic relations, and therefore the visa and stamps wouldn’t be officially recognized in my US passport. Once I was in North Korea and through the immigration desk, my US Passport and visa document were both collected from me, and held by one of the government tour guides for the remainder of the trip. It was a strange feeling to have my passport taken from me, and made me feel like if I messed something up, they’d just keep it. Also in this photo are my ticket stub, customs declaration card, health & quarantine declaration card, and entry/exit card.